Tiny needles - too small to be seen by the naked eye - may one day offer an effective treatment for eye diseases, including glaucoma, the second-leading cause of blindness around the world. Glaucoma is marked by increased pressure in the eye caused by an over-production of fluid. 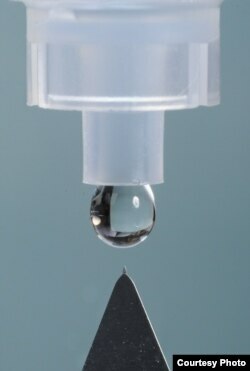 While it can be controlled with daily eye drops that either reduce the fluid, increase the flow of tears from the eye or both, studies show only 56 percent of patients use the drops every day. If doctors need to inject medicine into the eye for other conditions, they routinely use a hypodermic needle, but that can be uncomfortable for the patient. Now, incredibly tiny needles, about 0.4 to 0.7 millimeters long, can penetrate the eye only as far as needed to deliver the treatment - painlessly and efficiently. Its developers foresee time-release drugs injected every three to six months to replace daily glaucoma eye drops. The so-called microneedles could easily replace hypodermic needles for injections into the front of the eye. According to Mark Prausnitz, Director of the Center for Drug Design, Development and Delivery at Georgia Institute of Technology, the tiny needles are a better drug delivery vehicle than an eye dropper, which can flood the eye with medicine. “What the microneedle enables is a very targeted delivery to put the drug in the spot where it needs to be within the eye so that the drug is as potent and effective as possible," said Prausnitz, who helped develop the microneedles along with researchers at Emory University. "And the drug doesn’t go to other places in the eye where it can cause side effects." And being able to target the drug means that less medicine is needed. The microneedles are either hollow like a regular hypodermic needle, or they are coated with a drug which dissolves into the eye. In tests with mice, Prausnitz says the tiny needles were effective in treating glaucoma as well as corneal neovascularization, which is the growth of unwanted blood vessels. “One was a glaucoma drug where we were able to control the pressure inside of the eye," he said. "The other was a drug that stops blood vessel growth. And so when there was abnormal blood vessel growth going into the cornea due to an injury, we were able to administer that drug and suppress the blood vessel growth." Prausnitz also says some people may find the microneedles uncomfortable despite their miniscule size, so a topical anesthetic could be used to deaden the pain. A biomedical company is already testing the hollow needle to reduce inflammation in the back of the eye that can be treated from the front. The solid needle for treatment of glaucoma is still undergoing development. An article on the tiny needle technology is published in the journal Investigative Ophthalmology and Visual Science.